After leaving the Oregon Coast, the next stop of our summer family vacation in the Pacific Northwest was Crater Lake. 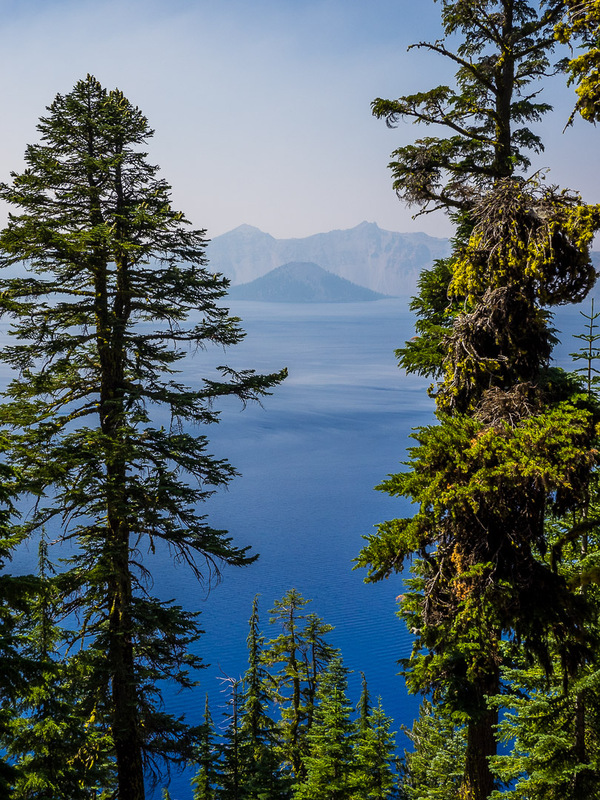 Established already in 1902, Crater Lake is the fifth-oldest national park in the United States and also Oregon’s only national park. For some more information and more photographs of this jewel, continue after the jump…. Getting accommodation directly in the National Park proved to be impossible, so we stayed in Chemult, about a 45 min drive north of the lake. 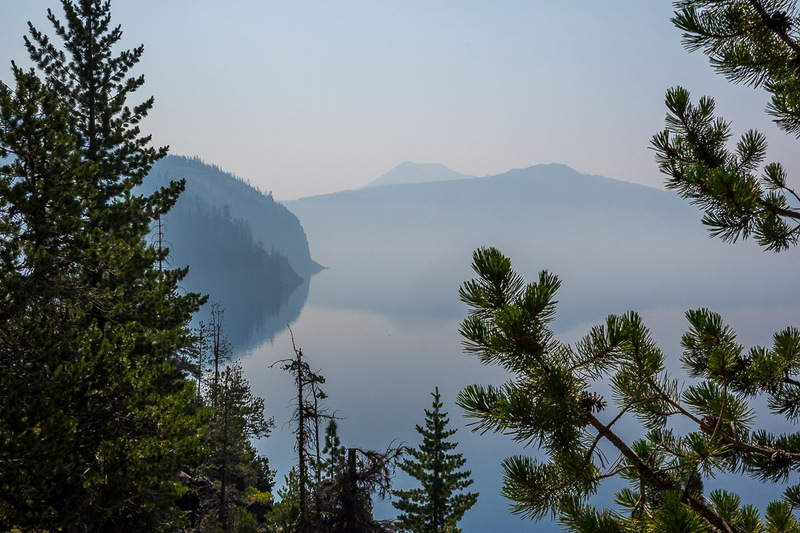 When we arrived in Chemult the evening before, we almost lost hope of seeing much of the lake, as the air was completely fogged up with smoke from the major wildfires burning in California and Southern Oregon. When I checked the webcam from Crater Lake Lodge, there was just…a brown wall. But when getting up early in the morning, a slight wind was blowing and a least a bit of blue sky was visible overhead. We arrived around 10am through the north entrance and shortly after reached the rim road at Merriam Point. Although the air was far from clear, we got a first good glimpse of the lake and the only major island, Wizzard Island. 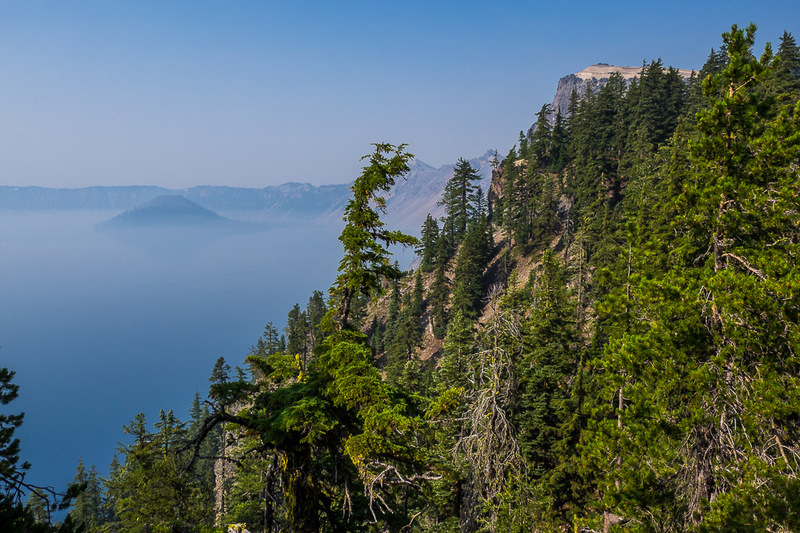 Crater Lake is a water filled caldera, a remnant of a destroyed volcano, Mount Mazama. The caldera rim ranges in elevation from 7,000 to 8,000 feet (2,100 to 2,400 m). Crater Lake has no streams flowing into or out of it. All water that enters the lake is eventually lost from evaporation or subsurface seepage, and the lake is refilled entirely from direct precipitation in the form of snow and rain. Mount Mazama began its existence in much the same way as the other mountains of the Cascades, as an overlapping shield volcano. About 7700 years ago, Mount Mazama collapsed into itself during a tremendous volcanic eruption, losing 2,500 to 3,500 feet in height. 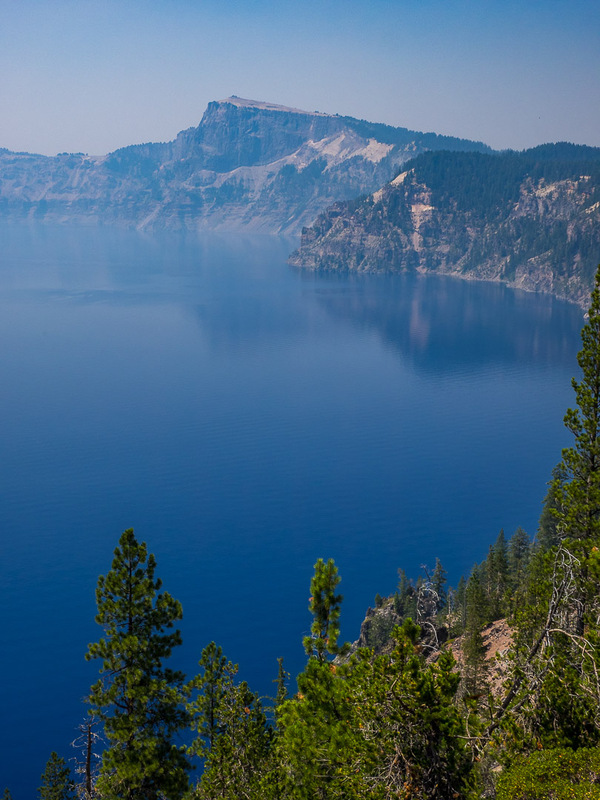 The eruption formed a large caldera that filled up with water and eventually formed a beautiful lake with a deep blue hue, known today as Crater Lake. 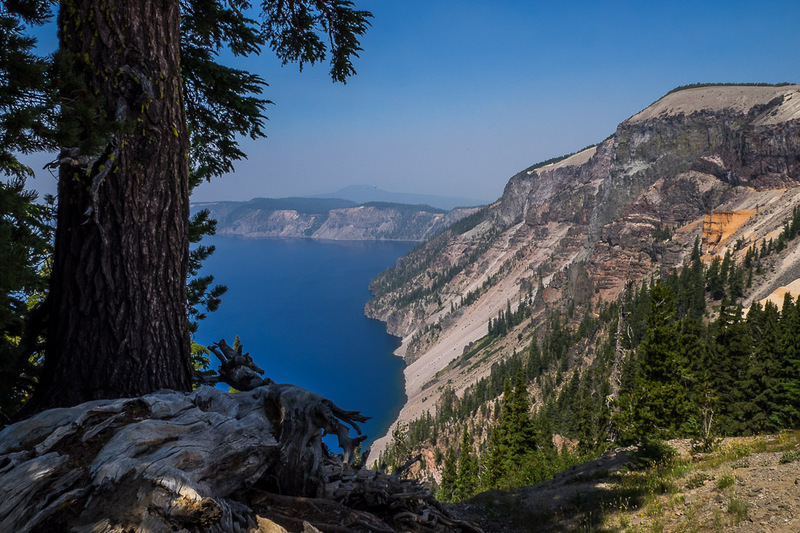 Local Native Americans witnessed the collapse of Mount Mazama and kept the event alive in their legends, with the lake becoming a sacred area. As initially the air clarity and quality of light was not all that great, I tried a more zen-like approach in my images, trying to capture shapes and shades. 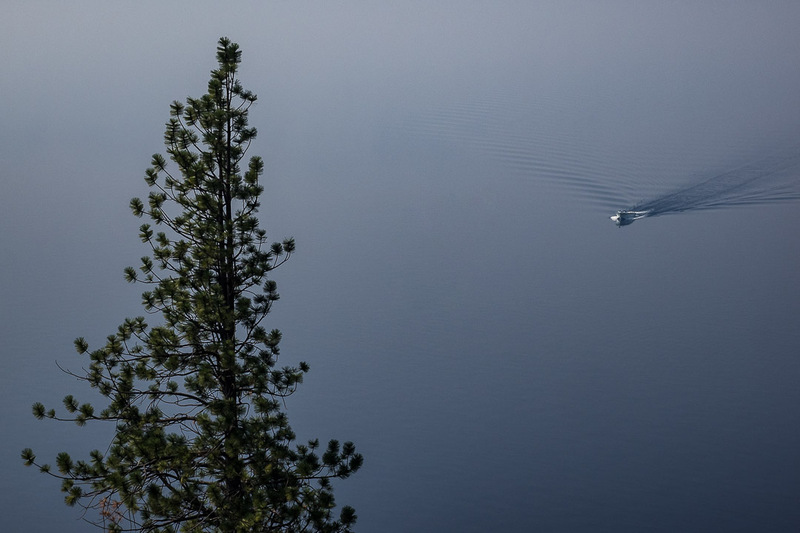 And somehow I got to capture another seemingly flying boat, like the week before in Olympic National Park. 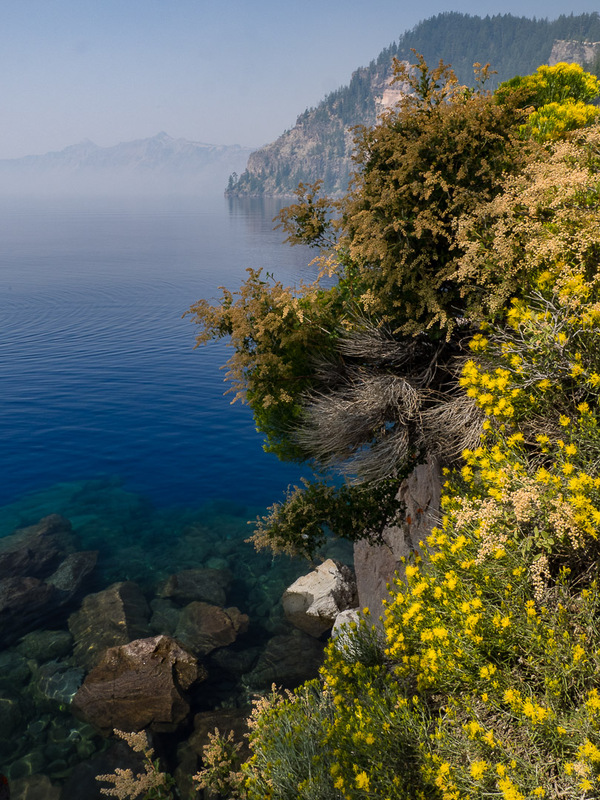 The lake’s water commonly has a striking blue hue, that we finally got to see after hiking down Cleetwood Trail to the cove with the same name, from where the boat tours around the lake and to Wizzard Island depart. Advanced booking is definitely advised, as every tour for the rest of the day was sold out when we checked availability. As we were not sure about the haze conditions, we had decided against a pre-booking. But we more than compensated by taking a cliff dive (Big Boy and Big Girl) into the really cold waters of the lake, which was a welcome refreshment from the heat of the day. 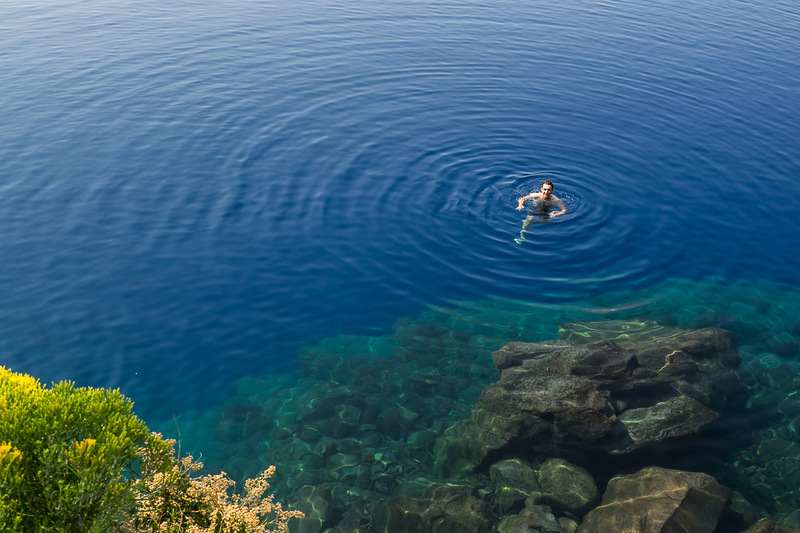 The lake is 1,949 feet (594 m) deep at its deepest point, which makes it the deepest lake in the United States, and the kids found it quite eerie swimming in this big bottomless blue. We continued our clockwise circumnavigation of the caldera on the rim road. Due to the many turn outs with ever changing views, it took us about three hours to complete the tour around the crater, excluding the hike down to the lake wich took another two hours including the swimming session and was quite strenuous due to the heat and the steep descent and ascent back to the parking. 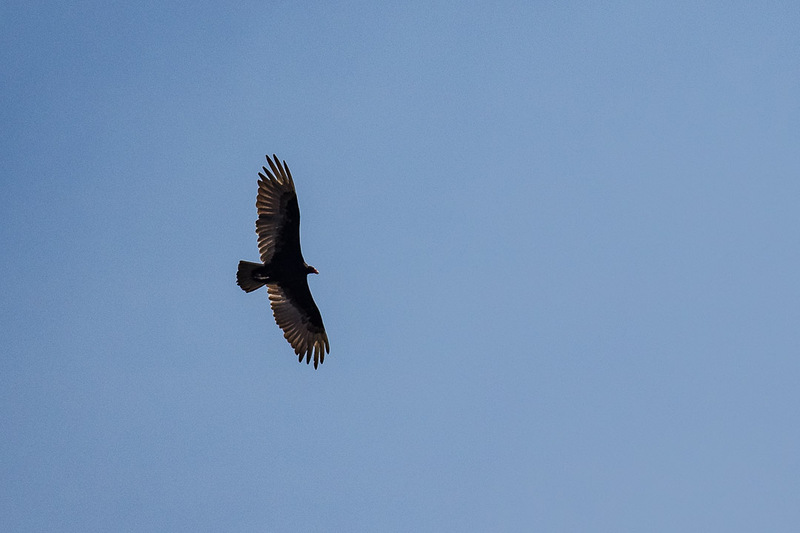 I managed to capture this shot of a bird of prey circling overhead, and it looks very much like a vulture to me. When we finally arrived at historic Crater Lake Lodge, visibility dropped to near zero within just a couple of minutes, with smoke filling all of the crater and the air quality dropping significantly. Still, we were so happy to have had a few hours with decent visibility, that allowed us to experience the magic of this true pearl in the Pacific Northwest. All photos taken with my Olympus OM-D E-M1 with the 12-100mm F/4. RAW conversion and post-processing in Lightroom Classic CC. Wish you a good week! Great blog post. You took an exact image of Crater Lake that I took. Keep up the good work. Beautiful shots as always. I am so sorry you had to contend with the smoke. So sad. That’s sounds great and with the changing season it could be even more dramatic. I know you will capture magic either way. So interesting to do this day out with you especially liked the geological information and photos. You did not mention whether it was difficult climbing out of the water. Wizzard Island, what a great name. Beautiful ethereal and mysterious lake pictures, and aren’t your kids brave! Too bad cameras weren’t invented over 7700 years ago. What a site to see. I am not brave enough for cliff dives, but the scenery there is just breathtaking! Great images, one of the best NP’s I ever visited in the USA. What a marvelous adventure! Hats off to your kids especially for their diving prowess — no way would I have been as brave. Gorgeous photos as always, Marcus. Thank you for taking the time to share them here. 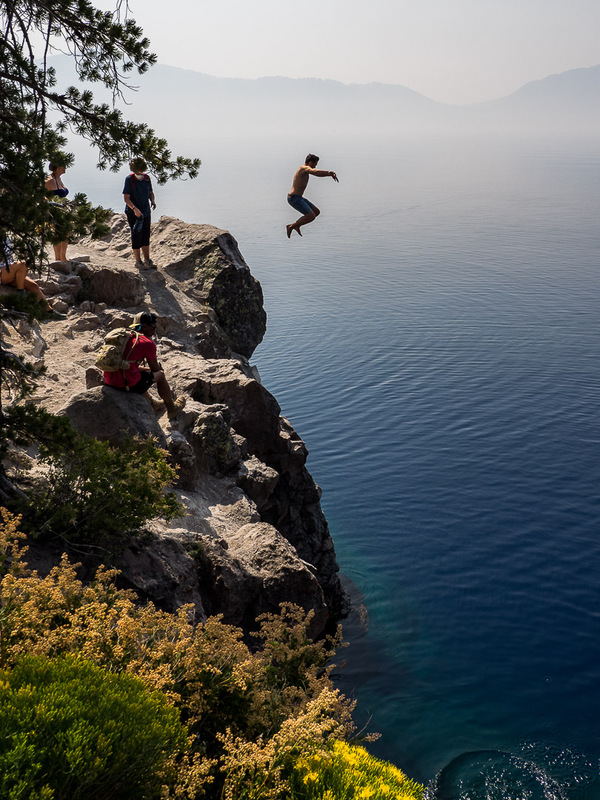 Beautiful photos Marcus, what a superb shot of your children diving off that big cliff. Your photos are so intereguing. No matter what ever hindrances they present the good contrast and sharpness. Serene is the word that popped up in my mind when I saw them. You are always welcome, Sir. Despite the less than ideal conditions your photos are gorgeous. The one of your son jumping off the cliff is amazing. Too bad there was so much smoke to prevent you from getting a clear view of everything. I was there three years ago, and it was clear. But the park closed off 3/4 of the road because there was a bicycle event.